Air Filtration in the Automotive Industry - Auto Air Filter Equipment | Air Purification Inc. The production lines of the automotive industry are a large contributor to the country’s economy. Automobile production hit a dip in 2008 but has since rebounded to become one of the fastest growing industries in the United States and the rest of the world. With the rapid growth within the industry, have more stringent safety standards have been put in place to ensure product quality and worker safety. 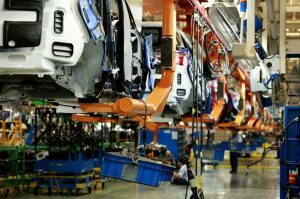 Air quality in automobile manufacturing plants is an absolute necessity as air pollution creates a direct danger to employees and the environment. With over 200 years of engineering and design experience in air filtration, Air Purification Inc. is the perfect choice in helping you find the right system for your company. What Kinds of Air Particles Affect the Automotive Industry? These risk factors can eventually lead to a workplace disaster and possibly damage property and your employees’ health. Even the tiniest malfunction on the production line can put work schedules off balance and lead to significant delays and loss of profit. Our 33 years in business have taught us that clean air creates profitability. If you take the time and effort to manage something often overlooked like air quality, the benefits are exponential. HEPA filters: Sort out even the finest particles in the air, which are often the most dangerous. Regular cartridge filters: help filter out the immediate vicinity of the production line to reduce worker exposure. We take customer service seriously and want to ensure you are not only walking away with the products that help your company thrive but are completely satisfied with the process from start to finish. At Air Purification Inc., we have expert representatives on demand to help you every step of the way. Our dedication to our products and customers, along with our wide range of manufacturer options is why automotive giants like BMW trust us with their air filtration needs. We make sure to take care of your air so you can take care of the rest.